Have you ever wanted to like a movie so much because you just knew that it was made for you? I was sure that indie horror movie "The Void" was for me. Each new trailer and Kickstarter video (I did not crowdfund it, but I thought about it) made me more excited. Here was a gory, special-effects-driven horror film influenced by the surrealism and cosmic fear of H.P. Lovecraft and Clive Barker, and filmmakers John Carpenter, George Romero, and Lucio Fulci, especially Carpenter's "The Thing," Romero's "Night of the Living Dead" and Fulci's "The Beyond." Unfortunately, "The Void" did not live up to my high expectations, and it didn't give me many reasons to meet it at its bar-lowering level. It is indeed an homage to Lovecraft, Barker, Carpenter, Romero and Fulci (who, when listed together, sound like the world's spookiest law firm). But co-writer/director duo Jeremy Gillespie and Steven Kostanski fail to synthesize their influences in a meaningful way. I don't want to say that this is a common problem with indie horror films, because half the fun of being a horror fan is looking for new stories amidst heaps of tired genre pastiche and shameless "homages" (Carpenter has especially been homaged to death within the last couple years). 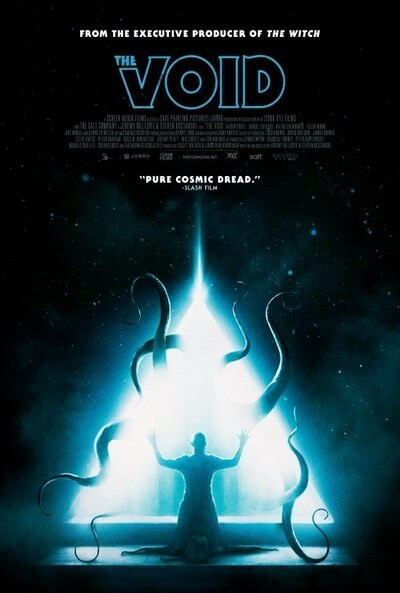 "The Void" sounds irresistible, but it's poorly paced, thinly plotted, and unimaginative throughout its bloody special effects-centric set pieces. The film's plot is wafer-thin, but that's not the biggest problem. We follow a group of small-town residents, led by rookie cop Daniel (Aaron Poole), as they are besieged by murderous cult members, tentacle creatures/humanoid monsters with hideously deformed bodies. There's not much more to it than that. The cultists and monsters kill and/or transform anyone that opposes them, and human survivors have to kill face-less killers—the cultists wear white sheets with a black triangle at the center of them—lest they become the monsters that threaten their existence. "The Void" is a siege narrative, so style matters more than anything, and the style here is patchy and flimsy. Where to begin? The film's frequent use of close-ups and undistinguished (and primarily dark) color palette never let me forget I was watching a low-budget film. The characters never interact with each other in a way that suggests they're thinking or feeling anything beyond a generic fight-or-flight imperative. The performances are competent, but bland. The pervasive violence is monotonous. And the antagonists, while refreshingly tactile (ie: not computer-generated), look like leftovers from earlier/better movies. This film's under-cooked style made me feel like I was watching a jumble of stuff I've seen before, and will see again many more times in the future. But, as much of a diehard fan of this movie's influences I am, even I didn't really care to dig out significant connections between the film's inter-related influences. Sure, the most heavily pre-visualized scenes—especially nightmarish daydream visions of a foggy/cloudy Loveacraftian alien planet—are effectively creepy. But these scenes don't last long, and are frequently broken up by sequences where human characters—especially Daniel—wander around, and poke their heads into places they probably shouldn't (seriously, do not open that door! Or use those stairs! Or enter that operating theater!). There's a hint that the film's human protagonists are being targeted because they've all experienced or are close to somebody who has experienced childbirth-related loss. But beyond that, I honestly couldn't tell you what "The Void" is about aside from a blind need to establish Gillespie and Kostanaski's technical skills as horror filmmakers. It reminds me of an exchange from "Six Feet Under," where an art school teacher ruthlessly dismisses one of his students' work by telling the young artist that he isn't saying anything with his art beyond showing off which artists he's chosen to define his personality with. "The Void" is similarly a work by a group of young, unformed voices. People live, people die, monsters creep out of the shadows, but it's all a little too formulaic, cynical, and ... well, boring. That's the worst thing I can say about "The Void": I didn't really care who would survive, or what would be left of them. I also didn't feel like the film was consistently bloody, or unhinged enough to hold my attention. "The Void" didn't need to be the film of my dreams, but man, did it have to be so dull?